The meerkat story continues. But where and how did it all begin? A prequel to Animal Planet's hit series, MEERKAT MANOR: THE STORY BEGINS tells of the real-life adventures of a unique family of meerkats known as the Whiskers and their most beloved member, Flower. 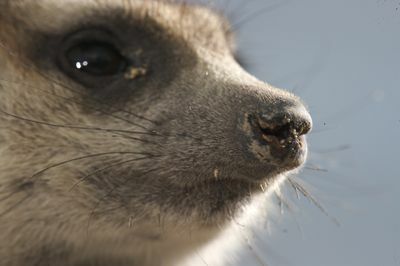 The feature documentary traces the rise of Flower from a young meerkat pup to the leader of the pack. But the family is soon in shambles and life at the Manor changes forever when the pack splits into two groups, led by Flower's daughters Rocket Dog and Maybelline. Follow the saga in the latest season of MEERKAT MANOR: THE STORY BEGINS and witness the bitter rivalry between the two power hungry sisters as they struggle for dominance and survival in the Kalahari. 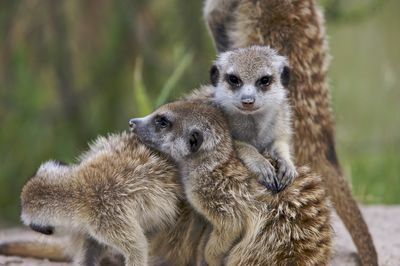 Flower was born in the Kalahari Desert to Holly, the leader of the meerkat group. During an attack by a rival group, the Lazuli, the Whiskers are forced to surrender their territory and move to a new home. A hawk kills Holly when Flower is a year old, and her father abandons the group to find a new mate, leaving her to fend for herself. Narrated by Academy Award-winning actress Whoopi Goldberg, MEERKAT MANOR: THE STORY BEGINS chronicling Flower's story from her birth up until the time of her tragically early death. Watch as Flower blooms into a remarkable matriarch and forges a legacy amidst the unforgiving landscape of one of the harshest deserts on the planet. On MEERKAT MANOR: THE NEXT GENERATION, sibling rivalry adopts a whole new meaning. Rocket Dog and Maybelline must live within the rather large shadow of their late mother, Flower, and there is very little room in the Kalahari for both sisters' clans. 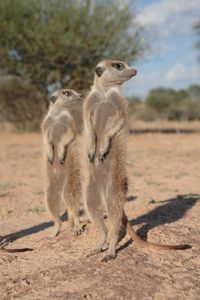 Faced with the threat of predators, harsh desert weather and their archenemies the Commandos, the meerkats must also deal with dissention within their ranks. 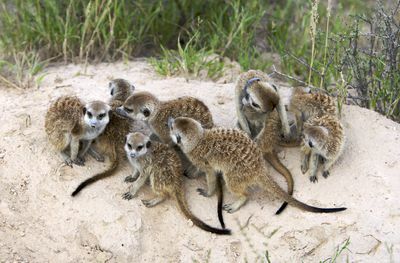 Without a solid leader to unify them, the meerkats face their toughest survival threat: each other. With two tribes split by squabbling kin, will one sister rise to unite the family or will fortune see them fall? MEERKAT MANOR: THE NEXT GENERATION is narrated by Emmy-award winning actress Stockard Channing. 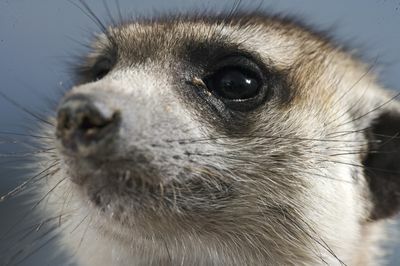 Since the tragic death of the manor's reigning monarch, Flower, the meerkats of the Kalahari Desert are in chaos. The Whiskers family divided; once-deserter Maybelline defied Rocket Dog's new leadership role in the Whiskers and started her own group, the Aztecs. With their archenemies, the Commandos, still knocking at the meerkats' burrow, both the Whiskers and the Aztecs find themselves weakened by the split. Zaphod and six of his males have deserted the Whiskers family and gone roving at the Aztec clan. Now Rocket Dog's problem is Maybelline's - dear old dad keeps chasing away the good men. While Rocket Dog is vying for Wilson's attention, subordinate Sophie gets there first. If Sophie is pregnant, it spells trouble for Rocket Dog. Rocket Dog is having trouble keeping her clan in line. When the Commandos attack the Whiskers, rookie Seacrest is at the head of the counter-assault. But when Rocket Dog chickens out and calls the fleet back, Seacrest doesn't hear the call and she is left to face the Commandos alone. Rocket Dog's cowardice costs the Whiskers their burrow, while Maybelline has finally snagged a suitable home for the Aztec clan. Are the burrows turning on the rivalling sisters? Rocket Dog's dreams have come true - she's pregnant. Now with legitimate claim as the Whiskers' dominant female, Rocket Dog finally shows signs of effective leadership. But even as her dominance solidifies more every day, Rocket Dog has a big problem in rival Sophie. She just might be pregnant too, thanks to a forbidden tryst with a rover. When Sophie is injured while foraging for food, the clan leaves her behind to fend for herself. If she can't learn how to shape up, the eviction will be permanent. Rocket Dog's brother Zorro heads off with a roving coalition in search of females. They get more than they bargained for when they target Nikita's vicious Commandos but without a dominant male to help fight off unwanted attention, Zorro's boys could be in luck. What starts as a simple roving mission soon turns into something altogether more sinister when Zorro makes his move on his family's worst enemy. Rocket Dog is in her final days of pregnancy. The first-time mom desperately needs to find a new burrow to give birth to the next generation of Whiskers. If she fails, her leadership could be in doubt. Zorro is getting his first taste of what life as a Commando will be like as feisty Nikita wages war on her pregnant subordinates. Rocket Dog has had her first litter of pups - and now it's the job of the whole family to keep them alive. Youngster Axel is joined on the babysitting job by Sophie, Rocket Dog's once exiled rival. 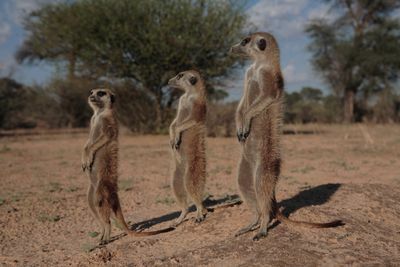 The pair find themselves in trouble when a strange meerkat approaches the burrow. In the ensuing confusion, an even more dangerous foe threatens the lives of the pups. Rocket Dog's pups are taken on an unscheduled outing away from the burrow by a pair of babysitters. It's a job that's usually handled by the whole family, and for good reason: it can be dangerous. The short trip turns into a nightmare expedition when a rival group shows up. With their family away, the little group finds themselves caught between a rock and a hard place. Pregnant Maybelline and her Aztecs are forced to fight their way out of trouble when old rivals the Lazuli reappear on the Manor. Nikita's new brood causes chaos at the Commando bunker. She is now attracting the attentions of the former Whiskers boys who all fancy their chances with the boss. Rocket Dog's pups Nugget and Beaker get their first lesson in desert survival out on the Manor. As the Whiskers move burrows, the pair has to learn quickly the difference between a feathered friend and foe. When war breaks out over rations and power at the Commandos boot camp, Zorro decides to teach his brother Miles an unforgettable lesson. Unwelcomed by his own natal group the Commandos, roving male Wilson goes off on a mission to meet the ladies and just maybe, find a group he can join - a burrow to call home. Taking his roving buddy Philippe with him, the big adventure brings him nose to nose with the Manor's dominant males, and tail to tail with willing and not so willing females. The family size has dwindled, leaving the Whiskers the weakest they have been for a very long time. The arrival of her second litter of pups couldn't come at a more opportune moment but when danger can come from any direction, the pups survival is far from certain. Heavily-pregnant, outcast Sophie seeks a return to the fold once more. Her own litter could help to change the fortunes for the group but will Rocket Dog allow her back? In the series finale, it's all out war at the Commandos when dominant male Zorro goes missing in action. Family history repeats itself when tragedy strikes at the Whiskers burrow.